Bake pie shell 10-12 minutes, until golden. Remove from oven and let cool. Line the baked and cooled pie shell with a layer of chocolate pudding, about half of the prepared amount. Add a layer of bananas. Top with remaining prepared instant chocolate pudding and remaining bananas. Cover the top with a giant swirl of whip cream from the spray can, starting at the center and working out. Shave a chocolate bar with a vegetable peeler and top pie with shavings. Serve immediately. In Recipes-list.com we have selected the most viewed recipes from category - uncategorized . Enjoy the best recipes specially selected for you! 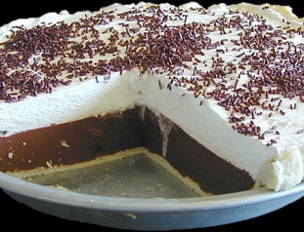 Quick Chocolate Banana Cream Pie is the right choice that will satisfy all your claims.